It has been nine days since a massive earthquake hit the coast of Ecuador causing much devastation and loss of life. Our hearts broke as pictures and messages poured-in on television and across social media. As you know, Ecuador and its people are very close to our heart. Allison lived there from age nine to eighteen, graduating from High School in the capital city of Quito. We have been praying and asking people to partner with us in mission and send us to Ecuador for over a year now. We are not quite funded and even if we were funded we would be in language school right now and not in country, but our hearts are in Ecuador with God’s people and our missionary family. Not being there to help our fellow OMS missionaries respond to this tragedy with the love of Christ has been difficult. We want to be there with them to help and encourage and respond as Christ leads. We want to work alongside Ecuadorean Pastors and churches and share the burden with them. We want to go but we have to wait. But our waiting is not idle waiting. 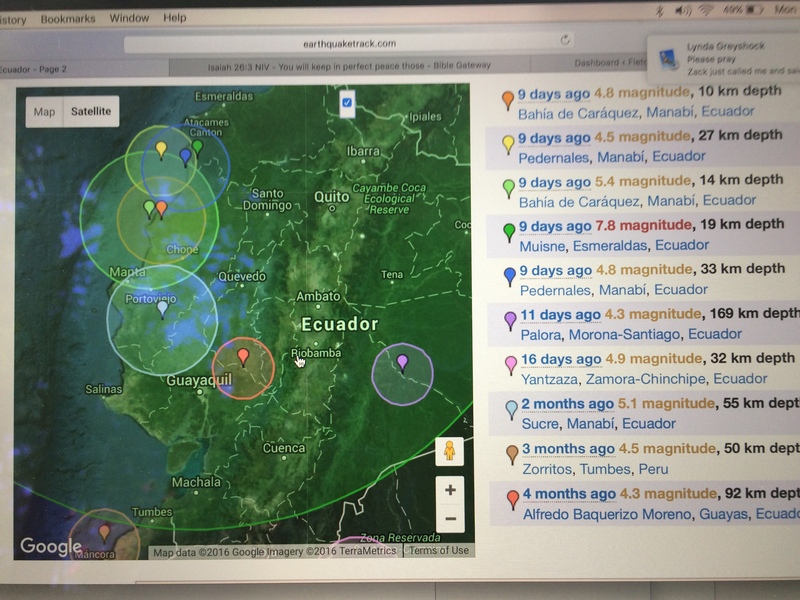 We have been fervently praying for Ecuador and for the OMS team. Thursday the 21st was a big day. Our friends went into several areas to bring in aide and to assess the need to make plans for future ministry. Allison awoke early in the morning to intercede. She prayed Isaiah 26:3 over them: “You will keep in perfect peace those whose minds are steadfast because they trust in you.” God did not cause the earthquake in Ecuador, but He will use this tragedy to bring people to Him. We keep our eyes on Christ, trusting in the author and the perfecter of our faith. We are praying that many people will make Jesus Lord and Savior and lives will be saved, miracles will take place, and that the very presence of God will hover over those who are broken and grieving. We want to be there, but we will keep our minds steadfast on Christ and wait on Him to bring us the partners who will come alongside us so that we can come alongside others. We are finishing our newest newsletter and it should go out this week. Keep an eye out for it. Inside you will find ways in which you can help the people of Ecuador recover from the earthquake as well as a ministry update from us. Thank you for your prayers and your partnership.